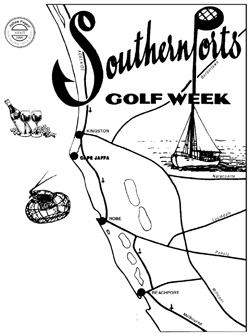 Southern Ports Golf Week (SPGW) is an event run by the Kingston SE, Robe and Beachport Golf Clubs. Kingston SE, Beachport & Robe are small coastal towns in the South East of South Australia. The area is well renowned for its crayfishing industry and fertile farming land, conveniently situated close to a large part of the South East of South Australia and Western Victoria. Since 1975, SPGW has been held annually beginning on the last Saturday of February. This week-long event is made up of a 54 Hole Championship, Foursomes Events & Mixed Events, for all handicap ranges, with A, B and C grades (Men & Ladies). The first Saturday sees the Mens and Ladies Pinehurst Foursomes being played. On Sunday there is a Mixed Pinehurst Foursomes. 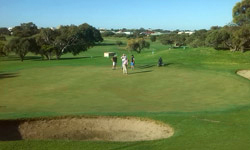 The 54 hole Championship Event is played at all three clubs on Monday, Wednesday & Friday. 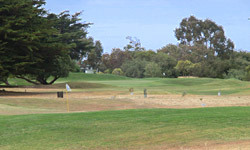 Each grade plays on a specific course each day. Each day has various starting times, depending on the number of players in each field. The last Saturday is a Mixed 4BBB Stableford which is played in a very relaxed atmosphere after a week of good fun & camaraderie. Individual clubs host other events on the remaining days. After celebrating our 40th year in 2015, we look forward to many more successful weeks of golf. The Beachport Golf Club is a nine hole, 2700m course located at the entrance of the town with lovely views over the ocean and township with easy access to the local shopping, accommodation and eateries. There is something for everyone at Beachport with walking trails, fishing, surfing, tennis courts, playgrounds, picnic areas, cinema, bowls, sailing, scenic drives and museums. Sandy beaches stretch around Rivoli Bay offering great surf and safe swimming, while Bowen Scenic Drive allows visitors to explore the coastal dunes offering spectacular views of the rugged coastline of the SouthernOcean. Settled in the 1830’s as a whaling station, today Beachport has a busy lobster fleet. You can take a walk down the second longest jetty in South Australia to admire the boats or throw in a line. The Pool of Siloam, seven times saltier than the sea is reputed to bring relief for arthritis and rheumatism, or aching muscles after a round of golf! Lake George is a popular area to sailboard, kayak or view the magnificent birdlife. Other attractions include the "Woakwine Cutting", an engineering feat one kilometre long through the Woakwine Range made by two men and a D7 tractor, located 12 kms north of Beachport with excellent views from the viewing platform. The Beachport Visitor Information Centre can provide the latest details on the spots to visit in and around Beachport. Don’t miss your chance to play on one of SA’s best 9 hole courses – Beachport is an enjoyable course whatever the conditions! Known as the Gateway to the South East coast, Kingston, set on the shores of Lacepede Bay, is one of the most recognised tourist destinations in the South East of South Australia. "Larry the Lobster" is situated on the Princes Highway at the entrance to the town, and the Cape Jaffa Lighthouse is on Marine Parade; other interesting attractions are the Coorong, Mount Scott and Butchers Gap Conservation Parks, with many bushwalks, the Analemmatic Sundial - one of few in the world, the Granites and several museums. More information can be found at the Tourist Information Centre, based in the Kingston District Council Office. Our beaches are claimed to be the safest in Australia and the Wyomi and Pinks Beaches can offer the whole family a variety of activities whether it be scuba diving, windsurfing, sailing, fishing from the beach or a boat, swimming or just to relax. The Kingston and the Cape Jaffa jetties offer great fishing spots. 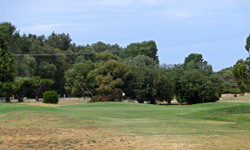 The Par 72 Kingston Golf Course is situated 1 km south of the town and has been extensively redeveloped and redesigned over the last few years. Although no sand bunkers, the addition of many dog legs, grassy hollows and mounds has made this 18 hole course a challenging and interesting one. The greens and fairways are well watered and well maintained and a credit to the Grounds Committee, the Greenkeeper and his band of volunteers. Other sporting activities available are tennis and bowls. Accommodation available at at Motels, Hotels, Caravan parks [at Kingston and Cape Jaffa], and B&Bs. Several new businesses have opened recently, giving the town a wide variety of retail outlets. Kingston is well worth a stay before travelling on. Robe has been a favoured place to visit ever since it was settled over 150 years ago. Built on the shores of Guichen Bay and surrounded on three sides by sea it experiences a milder climate than the surrounding areas in both winter and summer, rarely reaching 35 degrees. Many old buildings are still in use today. The establishment of a heritage trail is a recent addition to the attractions of the town. Blue plaques on the front of old buildings provide a brief history of their existence. Other attractions include the famous Obelisk, The Old Gaol, a refurbished Customs House and upgraded Royal Circus and the Beacon Hill Lookout. All attractions are easily accessible by car, bike or on foot. Robe has a large number and variety of places to stay ranging from motels, self contained units, beach houses, caravan parks and B & B accommodation. The tourist centre can assist those who need help finding somewhere to stay. The Golf Course is currently a 13 hole semi-links Par 69 course with work to extend the course to 18 holes well underway. We look forward to its completion in mid 2019. An upgraded club house and covered pergola overlook the "front nine" of the picturesque course. 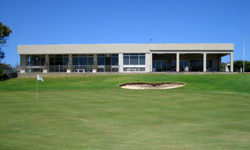 The "back nine" reveals spectacular views of the Southern Ocean as well as providing a golfing challenge for all players. 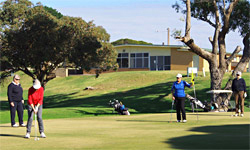 Visitors to Robe are also able to enjoy a wide variety of non-golfing experiences such as fishing, surfing, swimming, sailing, skiing, retail shopping, dining out, socialising at the club house or just lounging on our beautiful beaches. 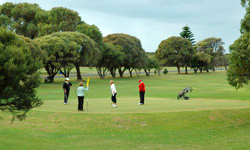 Other attractions such as wineries, caves and lakes are within easy reach of Robe.